Now that we've returned from Europe, I am discovering all kinds of interesting places I wish I had visited. This is the Water Palace in the Dachstein Mountains. The palace was built in 1520 and served as the summer residence of Bishops. In the early 20th century King Ludwig III, the last King of Bavaria, came here to seek refuge during the German Revolution. I want to go back and visit this place. And while I'm there, I need to check out a little something called the Dachstein Sky Walk. On our most recent trip, we visited the Chateau d'Amboise in Amboise, France, down in the beautiful Loire Valley. If you go there, you must also visit the Bigot Chocolatier. This chateau and little town are well worth visiting as you pass through France. Read more about this Chateau here. And just a short taxi ride or long bike ride from Amboise, we visited this awesome chateau on the Cher River. Chateau de Chenonceau. We took a boat ride under it, but chose not to go inside the castle. My twenty year old could only handle one castle tour per stop. 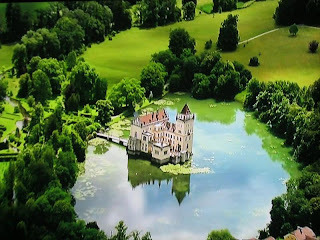 The chateau has a really long history, but the part that grabbed my attention was when Henry II acquired it while married to Catherine and living in the Chateau d'Amboise. Edward gave this chateau to his mistress Diane de Poitiers. When Edward died from a spear to the head in a jousting tournament, Catherine kicked Diane out and kept the chateau. If you're in the Loire Valley, I strongly recommend visiting both of these chateaus. Follow the links for travel information. For the boat tour, go to Croisieresdeloire or Labelandre for more info. Stop in the visitor's center at Amboise and let them make your tour arrangements, especially for the boat ride. Make sure you have your transportation plans well documented ahead of time. If you're not taking a bicycle, the taxi service can be sporadic. We got stuck over there with no way back to Amboise until finally the boat captain's wife drove us back after much crazy mis-communication due to language problems. They were very friendly and helpful, but we obviously spoke different languages. It was a rough couple of hours, but such a great memory. If you take the train to Amboise, make sure you either (1) have a taxi arranged to meet you ahead of time or (2) speak some French and can call a taxi. Rick Steves makes it sound like taxis abound, but that wasn't the case for us, we couldn't simply flag one down. I ended up going to the ticket booth to inquire about taxis, getting a paper with three taxi company phone numbers and sent to the local public phone booth. All three taxi companies did not speak much English. I finally managed to get one to come get us after about an hour of messing around. Rick Steves also mentions you can walk to your hotel, which is true, but difficult if you're staying near the castle in the old part of town. I wouldn't walk it, dragging a suitcase. You'll look ridiculous, go up and down curbs, cross busy streets and go up and down hills. Just make transportation arrangements ahead of time through your hotel. If you're going to Amboise, check out the travel tips at the bottom of my Chateau d'Amboise blogpost. There's some helpful tips including how not to get your laundry locked in the laundry room and lost forever.